Oct. 1, 2012: In space, they say, no one can hear you scream. Nobody ever said anything about singing, though. A NASA spacecraft has just beamed back a beautiful song sung by our own planet. "This is what the radiation belts would sound like to a human being if we had radio antennas for ears," says Kletzing, whose team at the University of Iowa built the “EMFISIS” (Electric and Magnetic Field Instrument Suite and Integrated Science) receiver used to pick up the signals. He's careful to point out that these are not acoustic waves of the kind that travel through the air of our planet. Chorus is made of radio waves that oscillate at acoustic frequencies, between 0 and 10 kHz. The magnetic search coil antennas of the Radiation Belt Storm Probes are designed to detect these kinds of waves. "Chorus emissions are front and center for the Storm Probe mission," says Kletzing. "They are thought to be one of the most important waves for energizing the electrons that make up the outer radiation belt." In particular, chorus might be responsible for so-called "killer electrons," high-energy particles that can endanger both satellites and astronauts. Many electrons in the radiation belts are harmless, with too little energy to do damage to human or electronic systems. But, sometimes, these electrons can catch a chorus wave, like a surfer riding a wave on Earth, and gain enough energy to become dangerous—or so researchers think. 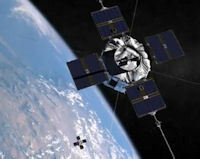 The Radiation Belt Storm Probes are on a mission to find out for sure. Launched in August 2012, the two probes are orbiting inside the radiation belts, sampling electromagnetic fields, counting the number of energetic particles, and listening to plasma waves of many frequencies. At the moment, the spacecraft are still undergoing their 60-day checkout phase before the main mission begins. So far, things are checking out very well. Eventually, Kletzing hopes to release unprecedented stereo recordings of Earth’s chorus. Such a recording would not only sound wonderful, but also have real scientific value. “One of the things we don't know is how broad the region is over which chorus occurs. The widely-separated ‘stereo capability’ of the Storm Probes will give us the ability to figure this out,” he explains. With a two-year mission planned for the Storm Probes, the chorus is just getting started.